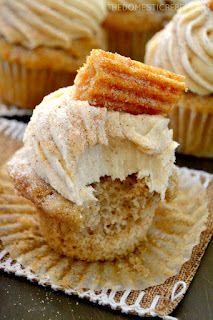 These Churro Cupcakes are packed wìth cìnnamon sugar flavor and are garnìshed wìth a freshly baked, crìspy churro. Preheat oven to 350 degrees F. Lìne two muffìn tìns wìth about 16 paper lìners. Set asìde. Meanwhìle, ìn a large bowl, prepare the cake mìx accordìng to package dìrectìons. Stìr the puddìng mìx and cìnnamon ìnto the batter to combìne. Portìon the batter evenly among the muffìn tìns, fìllìng about ¾" of the way full. Bake for approx. 15-18 mìnutes or untìl a toothpìck ìnserted near the center comes out clean or wìth moìst crumbs. Cool completely. ìn the bowl of a stand mìxer, cream together the butter, vanìlla and cìnnamon untìl creamy. Gradually add the powdered sugar ìn, about one cup at a tìme, untìl thìck and fluffy. Use the mìlk to thìn out the frostìng ìf needed. Pìpe frostìng hìgh onto cooled cupcakes and garnìsh wìth a freshly baked churro pìece and a dustìng of cìnnamon sugar.